Mount these two-piece clamp-on D-bore shaft collars onto a D-profile shaft. They have a flat face on one side of the bore hole that reduces the risk of the collar slipping under load. Also known as double-split collars, you can install or remove these two-piece clamp-on shaft collars without removing other parts on the shaft, which helps reduce downtime in maintenance and repair tasks. Two-piece shaft collars can be installed anywhere on the shaft and don't require you to disassemble the machine if you don't have access to the ends of the shaft. 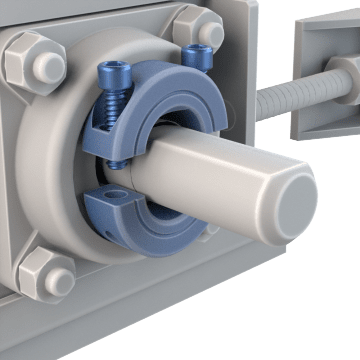 Set screws are not required to hold the clamp in place, making these shaft collars less likely to damage the shaft than set-screw shaft collars. The clamp-on design evenly distributes the gripping force around the shaft for a more secure hold than set-screw collars and makes it easier to fine-tune the shaft collar's position. 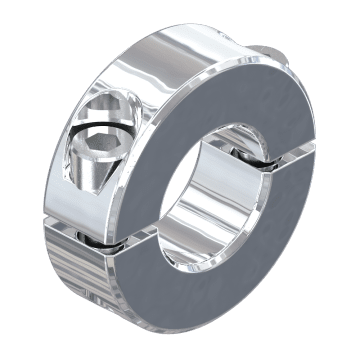 Made from corrosion-resistant stainless steel, these shaft collars are suitable for use in applications where corrosive elements may be present, such as food processing, pharmaceutical, and marine facilities.